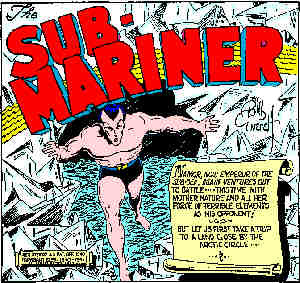 In both of his "first" appearances, Subbie (whose actual given name is Namor) was the only hybrid between the water-breathing folk of Atlantis and normal humans. His first interaction with his father's people, the surface-dwellers, was an attempt to wipe them out — making him, from our point of view, a super-villain. A highlight of Subbie's early Marvel Mystery appearances is his battle with the comic's other major star, The Human Torch, which sprawled across the 8th and 9th issues, June and July, 1940 (and which, incidentally, barely misses being comics' first superhero crossover, edged out by a May, 1940 meeting between MLJ's Shield and Wizard). Following this, he mellowed some, and decided the Nazis were more his enemies than the Americans. However, he never quite lost his edge. Even today, he remains his own man — heroic, but not necessarily, in any given situation, what we would call a good guy. It was perhaps his unpredictability that made him a great deal more popular than DC's knock-off, Aquaman. He swam into his own book in 1941, as well as appearing regularly in the back pages of The Torch's comic. He also had a regular berth in All Winners Comics, Marvel's answer to DC's World's Finest or Fawcett's America's Best, where the company's most popular features were all gathered together in one place. In the last two issues of All Winners, which appeared in 1946, its characters — Subbie, The Torch (with his teenage sidekick, Toro), Captain America (with his teenage sidekick, Bucky), The Whizzer (an imitation of DC's Flash) and Miss America — all banded together as The All Winners Squad, Marvel's first superhero group. As the 1940s wore on, the superhero fad began to fade. Marvel tried to revive interest by adding female partners to some (Subbie's was his cousin, Namora), but n 1949, what remained of their first wave of superheroes, including Subbie, bit the dust. There was a brief revival four years later, but by 1955, that, too, washed out, and Subbie was forgotten by the world. And vice versa, apparently. In Fantastic Four #4 (May, 1962), he was discovered in a Manhattan flophouse, stricken with amnesia, by a younger superhero using the name and motif of The Human Torch. The new Torch helped him regain his memory, but quickly regretted the act, as Subbie became one of The Fantastic Four's recurring adversaries. The early '40s sequence was reenacted, as Subbie was sometimes a good guy and sometimes bad, and which was which depended largely on your point of view. By 1965, he'd regained enough of a following to warrant a series of his own, so the "Giant Man & The Wasp" series was ousted from Tales to Astonish and Sub-Mariner installed in its place. Three years later, as part of a general expansion, Marvel once again gave him his own comic. Subbie's comic has been published only sporadically since then, but he's been a continuing Marvel Universe presence. In 1966, along with Iron Man and Thor, he was part of Marvel's first foray into TV animation. In 1971, he became a member of The Defenders, a group that specialized in characters that seem inappropriate in a group setting, such as The Hulk. He's even done a stint in The Avengers. The future is likely to be more of the same. Subbie is a little too prickly to qualify as a major headliner — but too interesting a character to disappear completely.